Kimchi is an absolute must at Korean table, be it at home or in a restaurant, breakfast, lunch or dinner. There is Museum of Kimchi in Seoul, South Korea, that lists over 150 types of kimchi. Check this video, it is quite interesting. 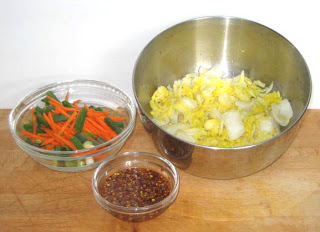 This recipe is based on Emergency Kimchi developed by Maangchi, author of one of the blogs that I follow. I am also subscriber to her website. Video of how to make her Emergency Kimchi (that I call Simple Kimchi) is on her website as well as almost 100 videos on YouTube channel. This is the best kimchi I had in long time. What is really nice about making your own is that you can control how much garlic and pepper flakes you use. As you can see at bottom of this post, I like it hot and Marjo’s is on milder side. 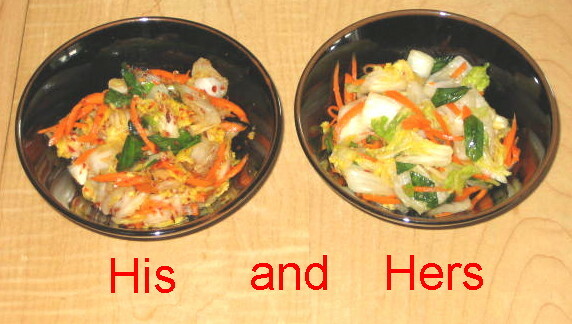 In Korea, kimchi in North is mild and farther South you go, spicier it gets. 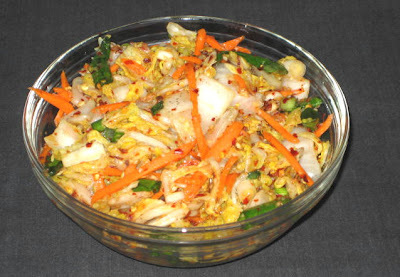 Note: I used traditional Napa Cabbage since I didn’t have any emergency. The Napa cabbage was in refrigerator J. 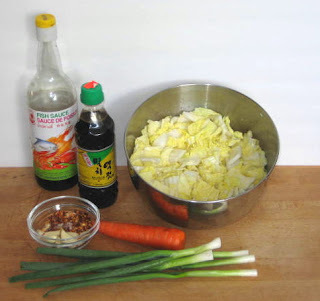 1/3 cup hot pepper flakes, 1 tbs sugar, ¼ cup fish sauce, ¼ cup minced garlic, 3-4 stalks of chopped green onion (1/3 cup worth), ¼ cup’s worth of julienned carrot.